Database Systems Corp. (DSC) provides products and services that help churches send call notifications to congregations. The automated program is available online and allows an authorized member of the church to login to an account on our secure website and initiate a calling program. Messages can be sent immediately to all of your congregation so that important events such as funerals or meetings can be broadcast to everyone at once. The church announcement can be recorded over the phone using DSC's 800 number service. Each campaign consists of a list of call recipients that can be created and maintained on this online service. The church member can record a special voice message using our phone service and send church calls to members of the congregation instantly. DSC is a leading provider of phone message broadcasting services at our own managed call centers. Maintaining contact with members of a church or synagogue is now a much easier task when using our church member calling services. Church announcements such as weddings and funerals can be automatically broadcast to all or part of your congregation with the same, consistent message using our automatic phone message broadcasting system. Why Use Automatic Church Member Calling Services? 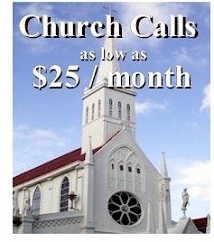 Automatic church member calling services are becoming very popular and affordable these days. Instead of relying on word of mouth or publications which are quickly out of date and expensive, automatic phone messaging lets you contact your congregration instantly! Here are just a few of the benefits and applications for this economical service. Contact DSC or visit our Church Calls website for a FREE analysis and quote and to learn more about our call announcement services.